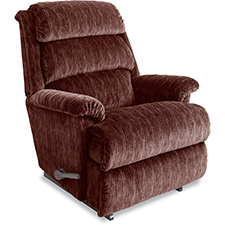 Big time comfort, the large scale Astor updates the classic tall man’s recliner with a few new tricks. With a taller base, generously scaled proportions and more relaxing options. Now available with PowerReclineXR, the power feature that lets you adjust the back and legrest independently at the touch of a button to any combination of positions for virtually limitless relaxing possibilities.